The Arc de Triomphe stands in the centre of the Charles de Gaulle Square at the end of the Champs-Élysées avenue. 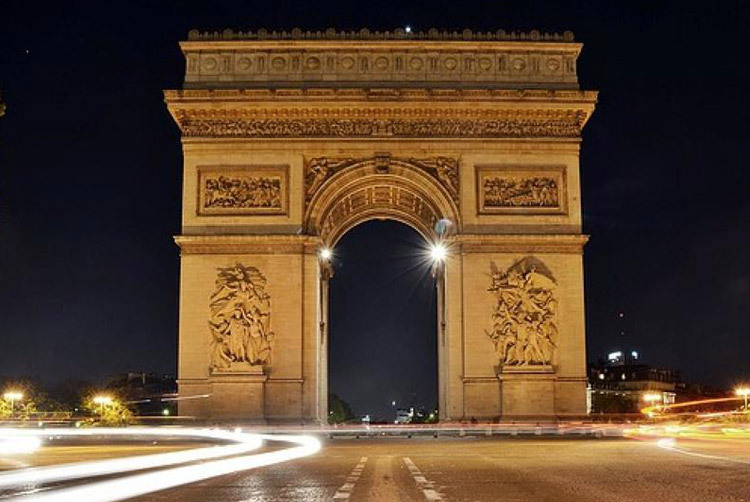 The Arc de Triomphe honours those who fought and died for France in the French Revolutionary and the Napoleonic Wars. Beneath its vault lies the Tomb of the Unknown Soldier from World War I. The monument stands 50 metres in height, 45 m wide and 22 m deep. Its design was inspired by the Roman Arch of Titus. The Arc de Triomphe is so colossal that three weeks after the Paris victory parade in 1919, Charles Godefroy flew his Nieuport biplane through it. The monument overlooks the hill of Chaillot at the center of a star-shaped configuration of 12 radiating avenues. It is the climax of a vista seen the length of the Champs Elysées from the smaller Arc de Triomphe du Carrousel in the Tuileries gardens, and from the Obélisque de Luxor in the place de la Concorde. From hotel Louvre Marsollier metro line 1 at Palais Royal to Charles de Gaulle Etoile in les than 15 minutes.